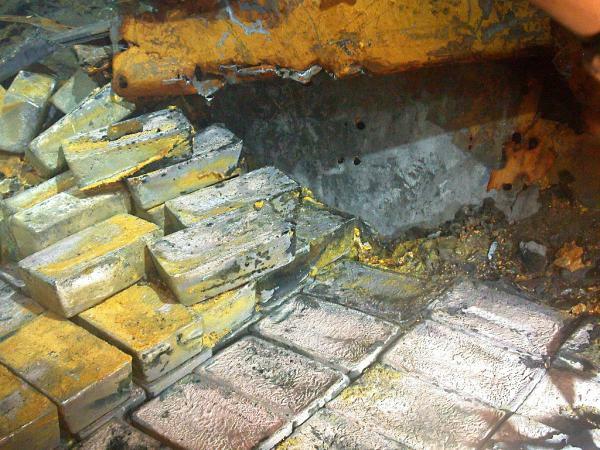 Odyssey Marine Exploration Inc., a deep-ocean exploration company, said it recovered about 48 tons of silver from a World War II shipwreck three miles (4.8 kilometers) beneath the Atlantic Ocean. The company retrieved 1,203 silver bars, or about 1.4 million ounces of the metal, from the SS Gairsoppa, a 412-foot (126-meter) British cargo ship that sank after being torpedoed by German U-boat in February 1941, Tampa, Florida-based Odyssey said today in a statement. The metal, worth $38 million at today’s prices, is being held at a secure facility in the U.K.
Odyssey said the recovered silver represents about 20 percent of the bullion that may be on board the Gairsoppa, which lies about 300 miles off the coast of Ireland. The operation, the largest and deepest recovery of precious metals from a shipwreck, should be completed in the third quarter. “With the shipwreck lying approximately three miles below the surface of the North Atlantic, this was a complex operation,” Greg Stemm, Odyssey chief executive officer, said in the statement.